I can’t help myself. Whenever I see a grocery store item that’s boasting ‘Buy-One-Get-One-Free’, aka BOGO, I’m going to cave-in and buy it. Such was the case with one-pint containers of grape tomatoes. I use them mostly in salads, but I snack on them, too. After I rinsed the tomatoes and patted them with a paper towel, I sliced them in half (they can be left whole). Placed the tomato halves in a mixing bowl and tossed them with a little olive oil, salt, pepper, and oregano to taste. The tomatoes were placed in a single layer in a baking dish, and roasted in a preheated 425°F oven for 15 to 20 minutes. Note: To make clean-up easier, line the baking pan with parchment paper or foil. 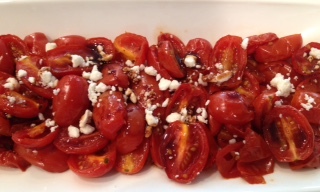 Once done, I arranged the tomatoes on a serving plate, drizzled them with pomegranate molasses**, and garnished the top with crumbled Feta cheese. Deeelicious! This can be served hot out of the oven or at room temperature. ** Pomegranate molasses is sold in Middle Eastern stores and in some supermarkets, or, try making your own - it's easy! love love everything thank you.